Health care is expensive and getting more so, squeezing private enterprise and driving up the deficit. Millions of Americans are uninsured which leads to bankruptcies and anxiety. How to lower costs and expand coverage without a drop in quality. The share of the economy devoted to health care increased from 7.2 percent in 1970 to 17.9 percent in 2009 and 2010. Costs are projected to rise to 25 percent of GDP in 2025. This amount was 48 percent higher than in the next highest spending country (Switzerland), and about 90 percent higher than in many other countries that we would consider global competitors. Despite the rate of spending, Americans do not have appreciably better health outcomes than people in other developed nations. The high cost of care and inefficiency is a drag on business productivity because those dollars cannot be spent on investment and employees. Health care benefits, at 12 percent, are the most expensive benefit paid by employers. "That kind of a cost, compared with the rest of the world, is like a tapeworm eating at our economic body," Warren Buffet told the Associated Press in 2010. Among the 34 OECD countries, only Mexico, Turkey, and the United States do not have universal health care coverage. Almost 50 million Americans did not have health insurance in 2010 - 16.3 percent of the population. The percentage of uninsured individuals varies greatly on a state-by-state basis -- Texas has the highest proportion of uninsured residents, at 24.6 percent. Massachusetts has the lowest, at 5.6 percent. Generally, states in the Northeast, Midwest, and Pacific Northwest have a greater share of insured residents than states in the South and Southwest. The biggest gaps in coverage were seen among foreign-born non-citizens, low-income families, and young adults between 19 and 25. The healthcare costs incurred by those without insurance are eventually shifted to those with insurance in the form of higher premiums. A 2008 study from Families USA, an advocacy group that supports coverage expansion, determined that the average family pays $1017 per year in higher premiums to help cover the cost of the uninsured. A majority of Americans (55.3 percent in 2010) receive medical insurance through their employers, but this number has been eroding as rising costs lead companies to determine that providing coverage is too expensive. In 2000, 64.1 percent of Americans had employer-provided health coverage. The decline in employer-provided coverage has been especially pronounced among businesses with fewer than 10 employees. If you are not covered by your employer, insurance is expensive or unavailable. Only five percent of nonelderly Americans receive coverage on the individual market. Many uninsured Americans are only one medical diagnosis away from bankruptcy. In 2009, a study by the American Journal of Medicine reported that medical debt was the number one reason behind bankruptcy filings in the U.S., accounting for 62 percent of personal bankruptcies. Even those with health insurance can find their coverage dangerously lacking: the New York Times reported in 2009 that approximately three quarters of people pushed into bankruptcy by medical bills were actually insured when their medical problems began. Federal health care programs, including Medicare, Medicaid, and the Childrens' Health Insurance Program (CHIP), comprised 21 percent of the 2011 federal budget, totaling $769 billion dollars. Nearly two thirds of this amount went to Medicare, the health-insurance program that covers approximately 48 million disabled and elderly Americans. The remainder went to Medicaid and CHIP which provide health care to 60 million low-income children and families and are co-funded by states. These costs are projected to rise dramatically in coming years as the weak economy increases enrollees and the population ages particularly increasing Medicare costs. According to Congressional Budget Office projections, spending on Medicare and Medicaid, which equaled 5.5 percent of gross domestic product in 2009, is predicted to rise to 6.6 percent by 2020 and could conceivably reach 10 percent by 2035, consuming more than half of all federal tax revenues. And the spending growth may be larger than meets the eye. The Medicare Sustainable Growth Rate, dubbed the "doc fix", was created in 1997 to curb medical spending by setting payment targets for physicians administering to Medicare patients. The measure has required yearly reductions in physician payments since 2002, but Congress has blocked the reduction every year. Abandoning the doc fix by freezing physician payments between 2012 through 2020, according to the Simpson-Bowles deficit commission report, would cause an additional $267 billion in Medicare spending. America has a growing shortage of primary care physicians who can help curb medical costs by addressing problems before they require the expensive intervention of a specialist. The American Association of Medical Colleges has forecast a shortage of 124,000 physicians by 2020, with 37 percent of that shortage in primary care. America currently has approximately 100,000 primary care doctors, and the American Academy of Family Physicians projects that we will need 139,531 in 10 years. At the current rate, American medical schools are graduating only half the necessary number needed to meet this demand.The shortfall is expected to be even more dramatic after 16 to 32 million additional Americans enter the insurance market due to the Affordable Care Act despite provisions in the act meant to encourage more doctors to choose primary medicine. Due to the high cost of a medical degree, many graduating physicians choose the more-lucrative path of a specialist instead of a general practitioner. Between 2002 and 2007, the number of medical school students seeking to practice family medicine declined by more than 25 percent. In 2008, the Journal of the American Medical Association reported that only 2 percent of medical school students in their final year were considering a career in general internal medicine. The president would like to stick with the law he already signed though he is open to modifying it. The Patient Protection and Affordable Care Act, signed by President Obama in 2010 and due to be fully implemented by 2014, includes a number of measures supporters claim will expand coverage and contain costs. The bill requires almost all Americans to purchase health insurance. Those who can't afford to will get federal subsidies. The law prohibits insurance companies from denying coverage to any individual based on their current health condition or set caps on total lifetime coverage. The law attempts to balance the cost of these requirements on insurance companies by adding to the pool of consumers through the individual mandate. Challenges: Many analysts have contended that the bill does not do enough to contain health care costs. The Centers for Medicare and Medicaid Services (CMS) estimated that despite the law's cost containment efforts, it would increase spending by $311 billion between 2010 and 2019. What do ACA supporters offer that will lower costs in the future? The promised deficit reduction in the bill is also under dispute: when the bill was passed, the CBO projected that it would reduce the deficit by $132 billion between 2012 and 2019. More than half of these savings ($70 billion) were linked to a long-term care program (the CLASS Act) which has since been abandoned due to rising cost estimates. More damning still was a 2012 report from Charles Blahous, a public trustee for Medicare and Medicaid, who predicted that the ACA would add at least $340 billion dollars to federal deficits between 2012 and 2021. Finally, many states are resisting the ACA's implementation. The federal government has pledged to bear 90 percent of the costs associated with Medicaid expansion, but some Republican state officials have refused to implement the Medicaid expansion fearing that a greater portion of the costs could be shifted to states in the future as Congress struggles to rein in the deficit. Even some Democratic officials have been noncommittal. Others states are resisting the implementation of insurance exchanges, the state-level marketplaces designed to expand coverage and lower cost by giving consumers a choice of plans. Exchanges require a substantial number of consumers participating to be cost-effective. If enough states opt out, some worry that the exchanges will not be a viable way to expand coverage. Mitt Romney would like to throw out the ACA and start over. Opponents of the ACA insist that it does not contain rising costs, but increases them by expanding the number of uninsured. Some suggest repealing the law outright; others would preserve isolated provisions, particularly the private insurance reforms. Challenges: Many opponents of the ACA have called for the law to be "repealed and replaced," but details on proposed replacements have been consistently sketchy. If the legislation is overturned, what comes in its place that will achieve the goals of reducing costs without harming quality of care? If they wish to retain the popular elements of the ACA--coverage of pre-existing conditions, expanded availability of prescription drugs for those on Medicare and prohibitions against lifetime insurance limits--how will they convince insurance companies to accept these reforms without the promise of additional customers? Scrapping the ACA also means dropping the revenue elements including an excise tax on high-cost employer-based health insurance, cuts in Medicare reimbursement rates, and the increase of capital gains and Medicare payroll taxes on higher earners. How will proponents of repeal find new cost savings? Finally, because of the Medicare expansion and the institution of insurance exchanges, an estimated 16 to 32 million Americans are slated to enter the insurance Market. How will opponents of the ACA provide coverage for these people if the law is repealed? A 2012 study from the Commonwealth Fund estimated that Mitt Romney's proposal to repeal the ACA would leave 72 million Americans without health insurance, compared with the 27.1 million people who would lack health insurance if the ACA is fully implemented. Policymakers, who support medical liability reform, including most Republicans and GOP nominee Mitt Romney, argue that the threat of a malpractice lawsuit forces many doctors to administer additional expensive tests to guard against the possibility of a patient's family suing them for not doing enough. This "defensive medicine" wastes resources and drives up costs. By limiting legal exposure, proponents argue costs will be lowered. One bill sets a three year statute of limitations on malpractice lawsuits and caps economic damage payments. Other proposals would establish medical courts, similar to bankruptcy courts, that could expedite malpractice proceedings and produce more consistent outcomes. The creation of a specialized justice system familiar with accepted medical standards could reduce the incentive for doctors to practice "defensive medicine." Challenges: Lawsuits may not drive up costs that much. The CBO estimated that healthcare costs associated with medical malpractice liability in 2009 totaled $35 billion, or approximately 2 percent of cumulative health care spending. A package of tort reform measures similar to the one described above, according to the CBO, would only reduce national health care spending by 0.5 percent. In addition, many states already have tort reform measures designed to limit costs associated with medical malpractice. Proponents of tort reform must explain what else they are willing to do to reduce health care spending. Health savings accounts (HSAs) allow people to deposit tax-exempt dollars into a fund that they can then apply to health costs. Supporters of health-savings accounts argue that people who control their own health care dollars will spend more selectively and judiciously, holding down health care costs through their cumulative decisions about which services are most valuable. In 2008 Republican presidential nominee John McCain proposed eliminating the federal tax break employers get for providing health care and using the revenue to provide individuals and families with tax credits to purchase insurance in the individual market. Many consumers would, presumably, opt for a portable, high-deductible plan, and because HSAs help people pay for their costs before they reach the deductible, the use of HSAs would become more widespread, eliminating wasteful spending by forcing consumers to put some skin in the game. Mitt Romney has proposed "unshackling" HSAs by allowing people to use money in the accounts to pay for insurance premiums. Challenges: How much money would each person start with in their HSA? If it's not enough, they won't be able to buy anything in the open market. Though HSAs exist now, those who can have opted to stick with their employer-based insurance coverage: a 2008 report from the Government Accountability Office (GAO) noted that 40 percent of those eligible had not yet opened an account. Wealthy households with disposable income benefit from HSA tax benefits, but lower-income households can't park extra cash there to pay for future care. The same GAO report noted that the average household income for those who deposited into a health savings account was $139,000, well above the $57,000 average of other taxpayers. Supporters of HSAs must explain how they will make the accounts a viable option for low-income households. If the answer is more tax breaks, they must explain how they will pay for the additional tax breaks. Mitt Romney and House Republicans would like consumers to be able to purchase insurance across state lines. Right now plans are regulated at the state level. By breaking that system consumers would have more choice which would increase competition and drive down costs. They point to interstate banking as an example of how increased choice can lower price and improve service. Challenges: Insurance regulations vary greatly from state to state. Opponents of this idea worry about a "race to the bottom," where insurance companies do business only in states with the fewest regulations. Healthy people would choose these plans. Insurance companies who seek to cover all ages would lose the profit they make off of younger people that they use to keep prices down for older and sicker policy holders, causing rates to skyrocket for those who use health care the most. Proponents of interstate health insurance commerce must explain how the market would not penalize the sick or what protections would be put in place to guarantee consumer protections. Progressive groups support a federal insurance plan (the "public option") to compete with private insurers for customers. The government's accrued bargaining power would give Uncle Sam more leverage in negotiating payments to providers, allowing the government to lower insurance rates, much as it does now with veteran's health benefits. Advocates also believe the elimination of a profit motive would free the money private insurers spend on overhead costs (management, shareholder payments, executive compensation, etc) to be spent on healthcare provision instead. 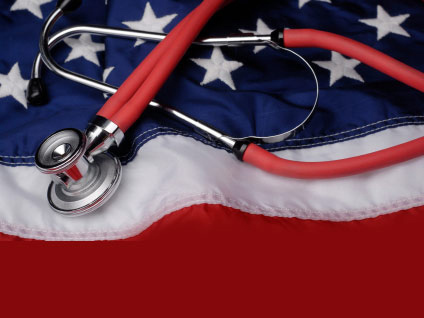 Challenges: Opponents argue that the federal government is inefficient, which means costs would not decrease, and that the federal government is also meddlesome, which would empower bureaucrats, not doctors, to make healthcare decisions. Some are concerned that private insurers could never compete with a government insurance program that could arbitrarily adjust pricing. As more consumers flee the private marketplace for the artificially low rates under the public option, these rates will inevitably rise, requiring either additional revenue or additional deficit spending. As a result, the public option could either blow a hole in the budget or monopolize the health insurance market without appreciably bending the cost curve. Proponents must explain how the public option remains just that - one of many options, not the only option in town. One provision in the Affordable Care Act restricts Medicaid payments to providers for preventable conditions, such as post-surgery infections or blood incompatibility. If providers know they will not be effectively compensated for treating an ailment that could have been prevented through more assiduous oversight, they will take greater personal responsibility in care management, preventing mishaps that could require costly future treatment. Challenges: It's hard to limit payments to doctors. Congress has been refusing to implement the "doc fix" since 2002. How would a politician promoting this option ensure that it would stick and therefore reduce costs? The Affordable Care Act, perhaps recognizing that elected officials could be gun-shy on enforcing provider payment restrictions, empowers an Independent Payment Advisory Board (IPAB) to restrict provider payments, removing a politically tricky decision from the hands of Congress. But critics have charged that the panel, an unelected panel of government bureaucrats, is simply another example of big government stepping between patients and the doctors who know best. Supporters of IPAB and provider payment restrictions must explain why top-down price controls can effectively rein in rising healthcare costs in a way that unfettered doctor-patient choice cannot.